Leaving Perth we head north to Yanchep. Here we look for the long neck turtles, kangaroos and koalas. In the winter we take a guided tour deep into the Yanchep Limestone Cave system. In the summer you will be dropped off on the Moore River. You will paddle down this idyllic river, while your guide drives down to the river mouth where you will be met with a well earned lunch waiting. 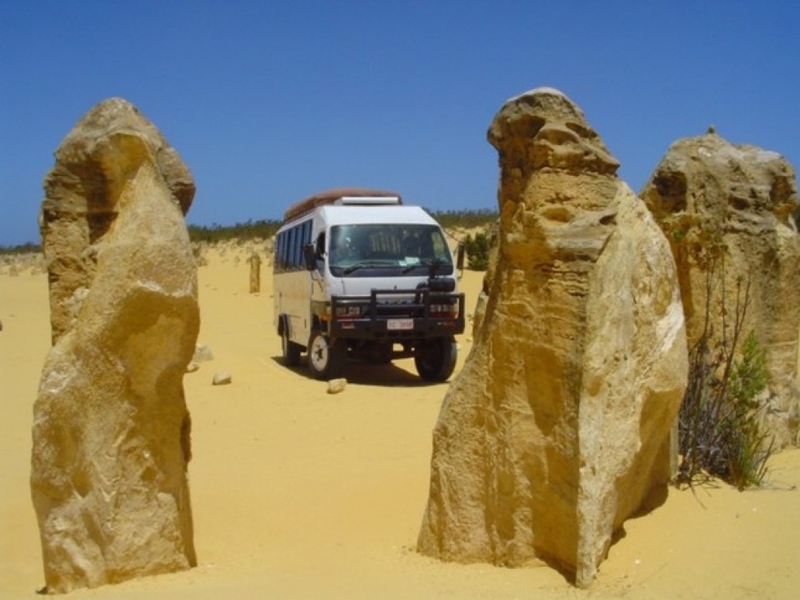 Then it's off to the Nambung National Park to find the strange and eerie Pinnacles Desert. Here we walk through hundreds of limestone formations standing starkly in a serene desert landscape. The driver briefly explains their formation and history. 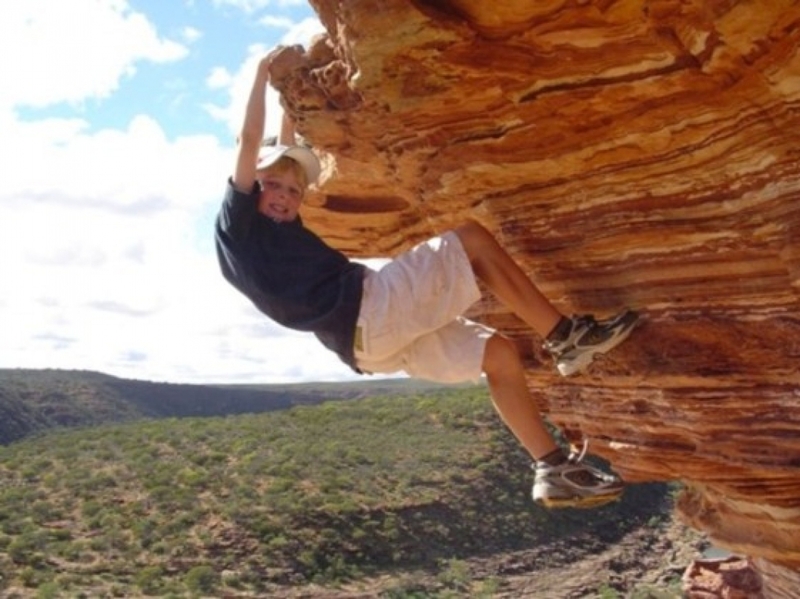 Your resulting photographs of the tourist icon of Western Australia, the Pinnacles, will be stunning. We are the only extended tour to visit the Pinnacles at the best time to see them, sunset! The Lonely Planet (2008) quoted that: "The Pinnacles at sunset will stay with you until the day you die". We spend the first night in the highly awarded Cervantes Lodge. From the Pinnacles Desert we head north, along the Indian Ocean Way, in many places literally on the coastline of Western Australia. 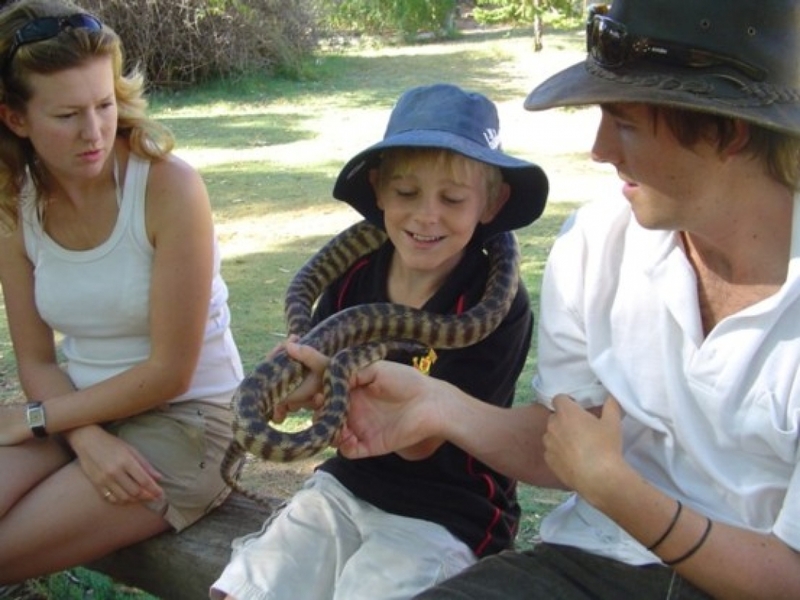 First stop is Greenough Wildlife Park (entry fee included in cost of tour), where can you wander amongst the kangaroos, and get personal with a python, as the parks owners introduces us to a range of West Australian reptiles. You will also get to see deer, camels, emus, a wide variety of birds, an ostrich and even a crocodile. Admission included in price of tour. After cruising along the Batavia Coast, and lunch on a beach near Geraldton, we drive down a red dirt road, with our passports (optional) to the Hutt River Province. Here Prince Leonard will greet you, stamp your passports, and take you on the Royal Tour of his Principality. It is a long story, but briefly, this is an independent state within Western Australia, which celebrates its 40th Anniversary, in April, 2010. In 1970, Prince Leonard, a farmer, in protest to unfair export quotas, had no option but to secede from Australia, or go broke, and went to war with Australia, before ceasing hostilities 2 days later, without bloodshed. As the Hutt River Province went to war with Australia and was not defeated, under a United Nations charter, the Hutt River now claims independent status. see www.hutt-river-province.com.au. With our exit visas in place we then return to Western Australia. After leaving the dirt road we have a short drive to Kalbarri along the coastal gorges which we will visit. In the winter months, especially August and September it is quite common to see Humpback whales hugging the coastline on their migration back to the Antarctic. This morning we head to the gorges of the Kalbarri National Park. We drive to the Z-bend gorge, where we get to trek and scramble down to the Murchison River, and well worth the effort of negotiating the tricky descent and challenging climb back up again. 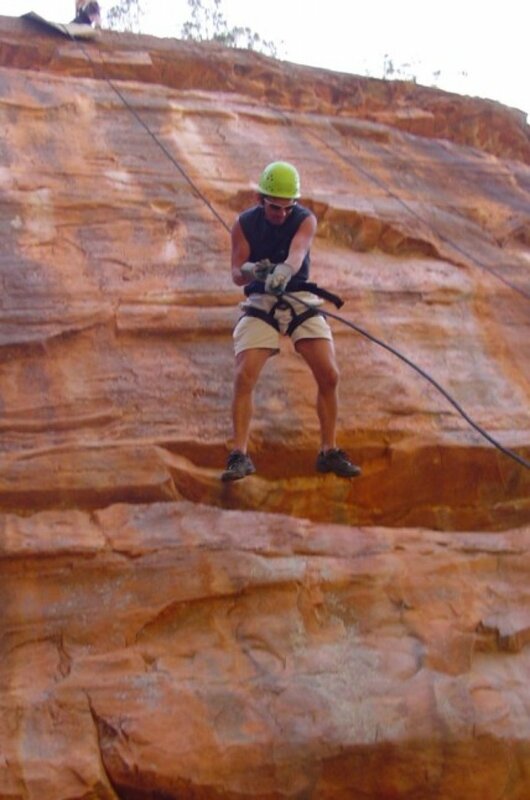 For the more adventurous, on the way down to the river, is the opportunity to have a go at abseiling. (Optional extra, $30 for two descents). If you are going to do it anywhere, this is the place. A moderate level of fitness and agility is needed to trek down the gorge. Once in the gorge a short walk along the valley takes us to our swimming spot in Murchison River (water conditions permitting). Leaving Kalbarri, we head out to Shark Bay via the Billabong Roadhouse. On the way to Denham we stop off at Shell Beach. Shell Beach is around 100km long, made up entirely of small shells approximately 8 to 10 metres deep. 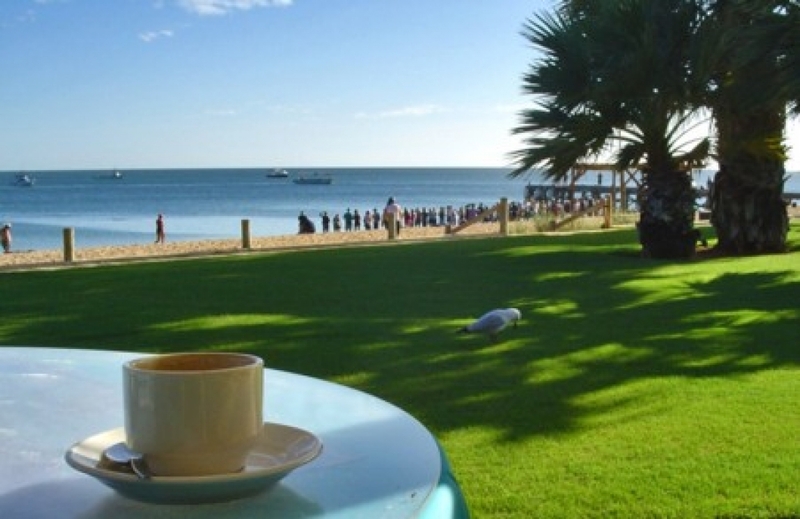 Upon arriving at Denham, you can head down to the beach and relax with a drink, enjoying the late afternoon sun, and a swim in Shark Bay. Though Red Earth Safaris have many unique features, it is Day 4 which really sets us apart from the rest. Tonight you can drag you bed out of the sheerers' quarters and sleep under the stars. However, the day of a lifetime starts with an early meeting with the magical Monkey Mia dolphins. 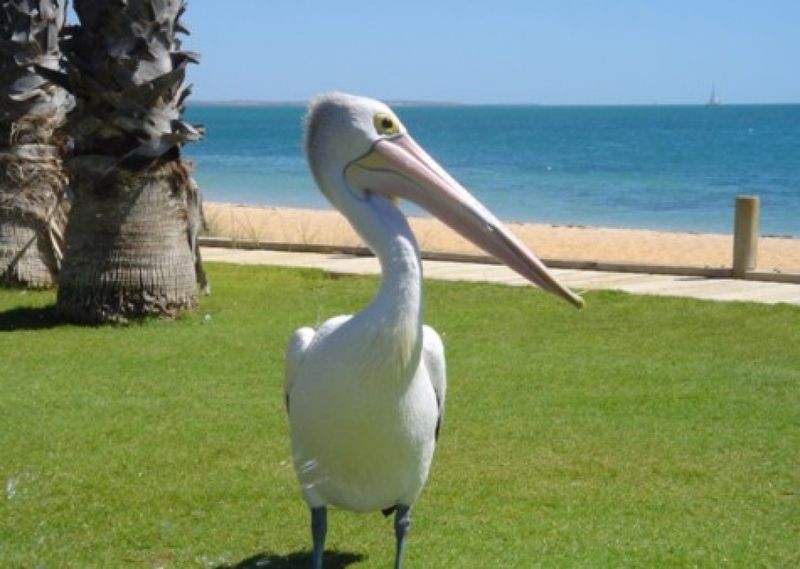 Make sure you have plenty of space on your camera's memory card, as unique opportunities to take photos of the dolphins, pelicans and other marine animals found at Monkey Mia are many. 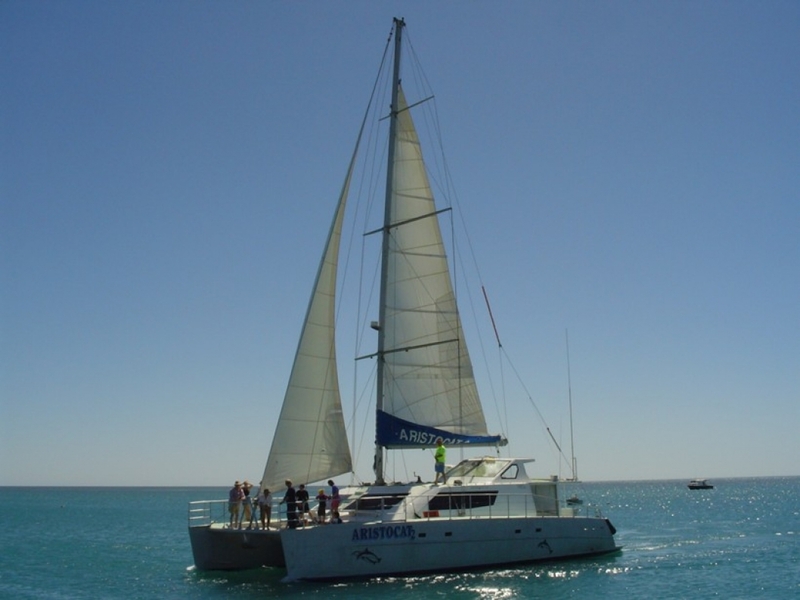 Take the option to jump aboard the Monkey Mia catamaran and cruise among the dolphins and unique dugongs. Shark Bay is home to the world's largest population of dugongs. Very few people have been in close proximity to dugongs so you are very privileged to be guided amongst these placid creatures by local experts. There is also the chance of seeing sharks, turtles, whales, seals sea-snakes and stingrays, but these sightings are less frequent. 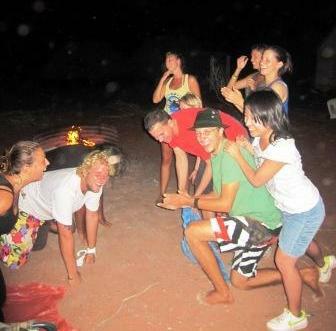 After the optional Shark Bay cruise savour the magical environment of Monkey Mia. Typically, the dolphins return for three feeds. We are often the only tour bus group still around to experience the late morning feed, which means an even more intimate experience with the magical dolphins of Monkey Mia. However, do remember the dolphins, though extremely reliable, are wild animals and don't time their visits to a clock. The beauty of being flexible is that if the dolphins don't turn up to the first feed we can hang around until they do. A priceless, once in a lifetime, must do experience. After lunch (sometimes a fresh Shark Bay fish is caught on the cruise, which are always a delicious treat) it is time to leave Monkey Mia. First, we return to Australia's most westerly town, Denham. Ten minutes later and we arrive at Ocean Park to see the turtles and Sharks being fed. Then its Eagle Bluff. This is a place where you can overlook one of Shark Bay's special wild beaches, and regularly see sharks and stingrays in the wild. It is quite common to see Tiger Sharks, which are numerous in Shark Bay. Next stop is to see the world famous Hamelin Pool Stromatolites. The stromatolites played a key role in the evolution of the earth, hence their importance, which we will briefly explain, to truly appreciate how significant the stromatolites are. 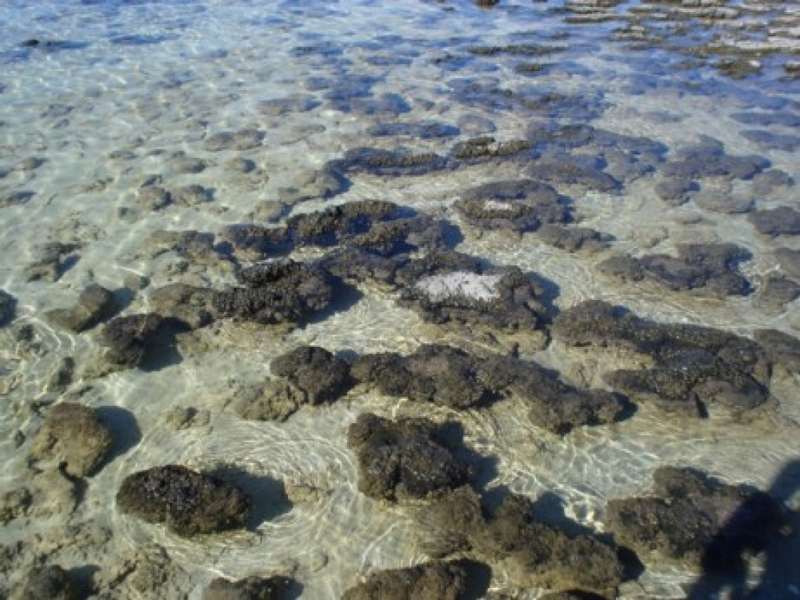 The World Heritage status of Shark Bay is largely down to phenomena such as the stromatolites. Of the many World Heritage sites around the world, Shark Bay is one of only a few which meets all the criteria. 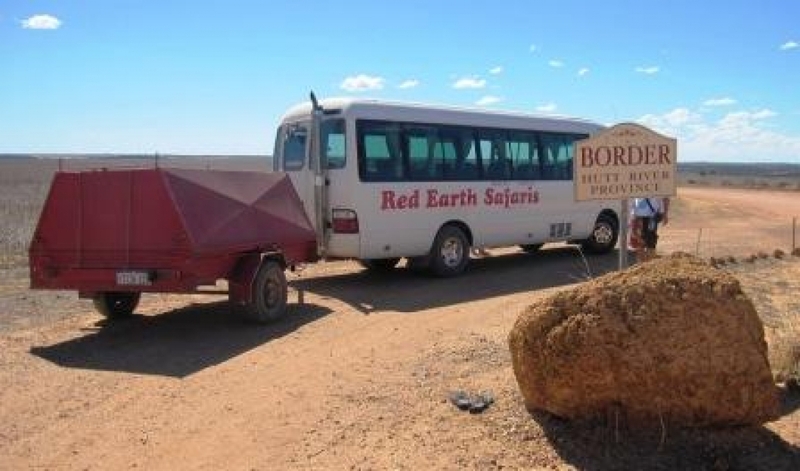 After our afternoon drive our Red Earth Safari finds us in real outback Australia. 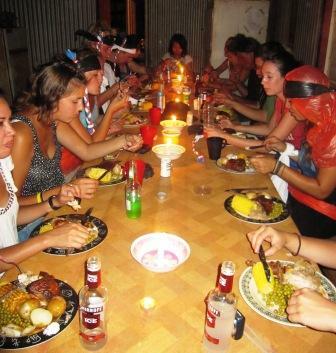 Cooralya Sheep Station (or ranch or farm) provides a chance to experience authentic Australia off the tourist route. Bring a sweater because the night air can be pretty cool. After dinner its time to sit by the campfire and go with the flow as the drivers will have the entertainment organised for what many say is the highlight of the tour. Leaving the Sheep Station we head north towards Coral Bay. On the way to Coral Bay the driver will explain what your options are for the day: they could be a half-day snorkelling tour out on the reef; a Quad Bike safari to a secluded beach through the dunes; or even a full-day tour to snorkel alongside the massive and graceful Manta Rays. Or you could just chill out for the day on the tropical white sand beach of Coral Bay. Departing later in the afternoon we soon arrive for our 2-night stay in Exmouth. A leisurely day exploring the northern reef. The highlight is usually the snorkelling at Turquoise Bay. Expect to see beautiful coral gardens, and masses of brightly coloured tropical fish. Look in the right places and you should also have the opportunity to swim alongside giant turtles and reef sharks. Then relax on the beautiful beach at Turquoise Bay. Express drive back to Perth, taking in Carnarvon on the way. Tonight is spent at the Northampton Backpackers (formerly a convent). We arrive back in Perth, usually early on Monday afternoon. Well, that's the end of the tour so did you have a good time? If you're anything like our regular tour guests you're sure to answer with a very enthusiastic, positive comment in our guest book. See the Raves section.